Two weeks from now the biennial Symposium on Cryptologic History in Fort Meade, MD, will take place. Organized by the NSA this symposium is the most important crypto history event in the world. I will take part in it for the fifth time in a row. Of course, I’m very excited about it. 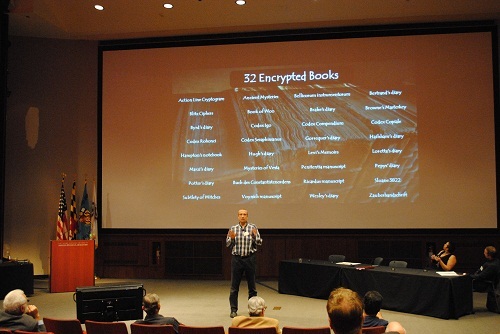 The following picture was taken at the 2013 event, when I spoke about encrypted books. 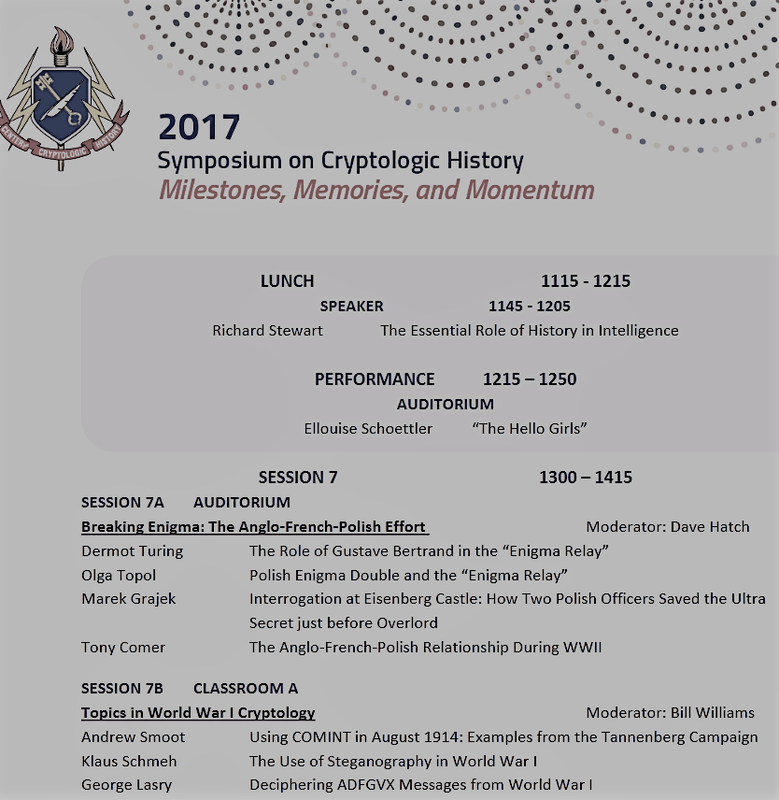 This time I will give two presenations at the Symposium on Cryptologic History. 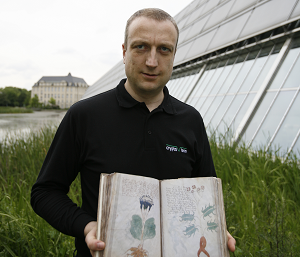 One will be about West German cryptology in the early Cold War, the other one about steganography in World War I. The steganography presentation I will give has, of course, a close relationship to my latest book Versteckte Botschaften, which is about the history of steganography. During research for this book I discovered over 30 cases of steganography use from World War I. Of course, I could not cover all of them in my book, but I could use them for an interesting symposium presentation (World War I is the key topic at the 2017 issue). One of the steganography examples from WW1 I came across is described in the book The American Black Chamber by Herbert Yardley (published in 1931). This books caused a huge scandal when it was published because it is full of top secret information about US codebreaking activities. 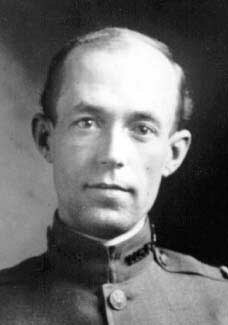 Author Herbert Yardley, who was the director of the major US codebreaking unit, published The American Black Chamber after this unit had been abolished with him being fired amid the Great Depression. The scandal this book caused is sometimes referred to as the “Snowden affair of the 1930s”. In any case, The American Black Chamber is a great book written by one of the major codebreakers of the time. In the caption it says: “Photograph of letter from British officer in Turkish prison camp to a girl in London. This shows a clever way for defeating the British Censor. 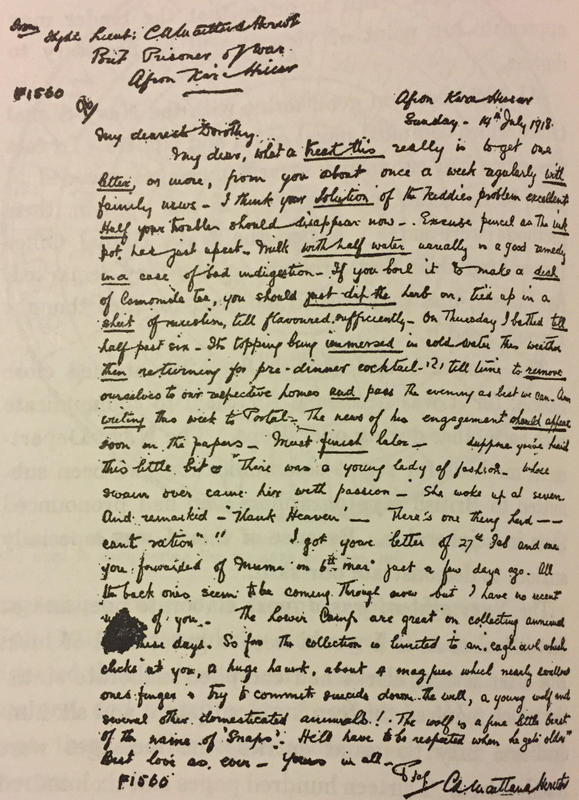 In the original letter the words were of course not underlined.” This is all the information the book contains about this letter. It goes without saying that this letter fits well into my symposium presentation. As it is dated July 14, 1918, it is clear that it was written during WW1. However, there are a few things I don’t understand. For instance, I wonder why this letter was allegedly written to beat a British censor. Wouldn’t it make more sense to assume that it had to pass Turkish censorship? Most of all, I ask myself how the recipient would know which words in the text formed the hidden message. Are these words marked in some way? Did the sender use a mathematical pattern (e.g. every sixth word)? 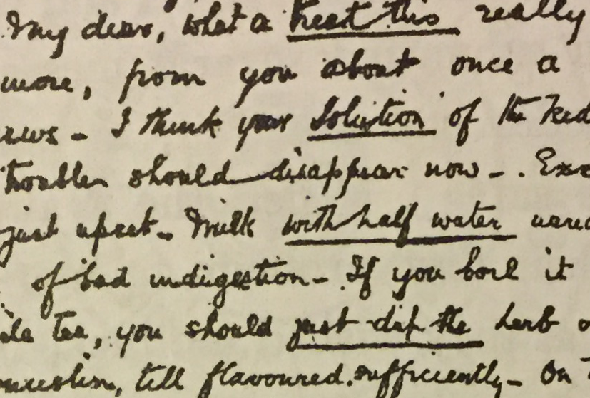 As far as I can tell, the cleartext reads as follows: Treat this letter with solution half ink with half water in a dish … How does it go on? Finally, I wonder if something about the historical background of this letter can be found out. On this website a code used on WW1 postcards is mentioned. However, as far I see, this code is not explained and no example is shown. Can a reader tell me more about it. 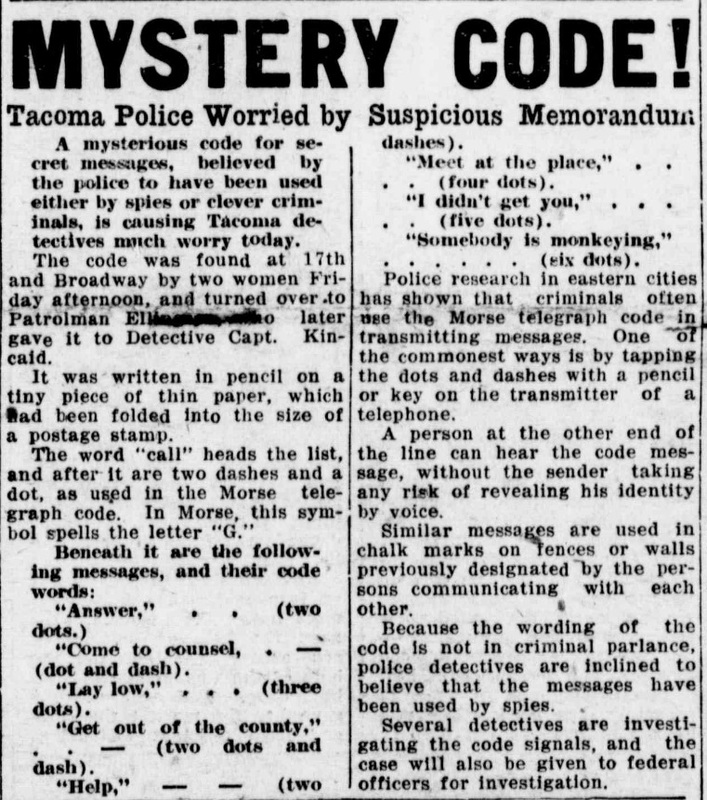 The following article about a mysterious code was published in the Tacoma Times almost exactly 100 years ago (September 22, 1917). Thanks to reader Georg Hermann for the hint. Does a reader know more about this code? Finally, if you know other stories about steganography in WW1 I would be interested to know. Maybe I can use them for my presentation. The letter was written in the camp of Afion Kara Hissar. Unfortunately I can’t read the name of the writer (first and last line). In the first line the rank: …Lieut.? As to the historic background of the letter: “A prisoner in Turkey” by John Still (1920, on archive.org). On p. 181 Still, who had been kept imprisoned in the Afion Kara Hissar camp, presents a similar steganographic method. Here the key is Pi (3.1415…): To reveal the hidden message you have to read the 3rd word in line 1, the 1st word in line 2, the 4th word in line 3 and so on. @Hendrik: Thanks! You’re right, this must be the way it worked. @Thomas: Thanks, this information is very helpful. I will include the Pi code into my presentation. @Thomas: Thanks! Stories like these are the one I’m looking for.